Welcome to our website, we are very excited about it and hope that you enjoy finding out a little bit more about our school! 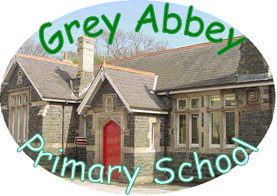 We are a busy, friendly school located in Grey Abbey on the Ards Peninsula. We are a growing school and currently have 89 pupils and 5 full time teachers. Our school is a beautiful stone building which is 130 years old! Over the years our building has been extended and modernised and we are continually aiming to improve our facilities to provide the best educational experiences for all of the children at our school. A few years ago we had a new office built and our staff room extended. During the summer of 2013 we had three out of four of our classrooms totally refurbished.